The game will take place tomorrow at Parkhead ahead of upcoming friendlies against France and USA. 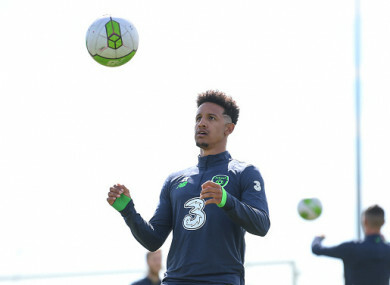 Callum Robinson in training at Abbottstown today. REPUBLIC OF IRELAND manager Martin O’Neill will take a squad of 18 players to Parkhead tomorrow for the testimonial of veteran Celtic midfielder Scott Brown [2pm]. The panel includes a number of new faces, including Peterborough United goalkeeper Conor O’Malley, Millwall midfielder Shaun Williams and Preston North End striker Callum Robinson. Shamrock Rovers attacker Graham Burke is also set to feature, despite being in SSE Airtricity League Premier Division action for his club away to Sligo Rovers this evening. The squad will be bolstered by additional personnel after tomorrow’s trip to Glasgow, as Ireland prepare for friendly internationals against France in Paris (28 May) and USA in Dublin (2 June). Email “O'Neill unveils 18-man Ireland squad to face Celtic in Scott Brown's testimonial”. Feedback on “O'Neill unveils 18-man Ireland squad to face Celtic in Scott Brown's testimonial”.